Helicopter Charter in Nepal | Helicopter in Nepal | Helicopter Rescue in Nepal | Heli Tour in Nepal | Summit Helicopters Pvt. Ltd. Summit Helicopters Pvt. Ltd. (previously known as Fishtail Air Pvt. Ltd.) is a helicopter charter company operating within Nepal, with its base in Kathmandu. The company was established in the year 1997 under the Air Operators Certificate issued by the government of Nepal. Since its commencement, the company has been actively involved in operation throughout the country with occasional Trans-border flights to Bhutan and India. With a fleet of three helicopters, which includes one AS 350 B3e "Ecureuil", one AS 350 B3+ "Ecureuil" and one Bell 206B III Jet Ranger helicopter. Summit Helicopters operates flights for sightseeing, rescue, medical evacuation, corporate movement, project support, expedition works or any other purposes that need the services of a Helicopter. We also operate support flights for trekking, which is getting really popular these days in the name of "Heli-Trekking". Aerial sightseeing flights over the heritage and tourist spots is quite popular these days who would like to have a glimpse of tourist spots within the Kathmandu Valley in a short time and from different angle. Rest assured, flying with us will be a special experience, as your safety and satisfaction are our prime concern. We give our best to cater to your needs and requirements. 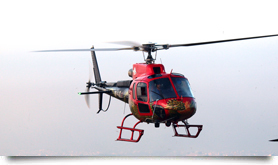 Thus, Summit Helicopters has been able to make a prominent mark in the field of Helicopter in Nepal.